ALBANY, GA – (September 18, 2018) – When it comes to the peanut, it’s true that big things come in small packages. 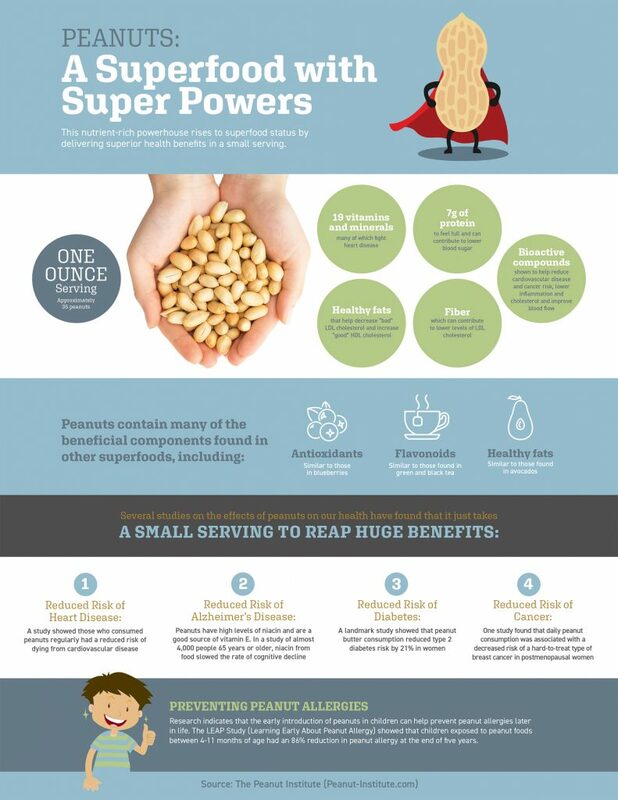 The peanut is a nutrient-rich powerhouse. In fact, based on a mountain of research, this mighty legume deserves superfood status. Numerous studies have found that the consumption of small amounts of peanuts or peanut butter has been associated with a reduced risk of cancer, heart disease and diabetes. In fact in just the past year alone, new research has shown that those who regularly consumed peanuts had a lower risk for four kinds of cancer – breast, colorectal, esophageal and pancreatic cancers [1-4]. A serving of peanuts is one ounce or approximately 35 peanuts. According to Dr. Sterling, the recommended daily serving is a handful of peanuts or 2 tablespoons of peanut butter. Bioactive compounds – Polyphenols, phytosterols and antioxidants are plant substances that offer health benefits beyond vitamins and minerals. They’ve been shown to help reduce cardiovascular disease and cancer risk, lower inflammation and cholesterol and improve blood flow. Recent studies have shown that consumption of peanuts or peanut butter helps decrease the risk of chronic diseases. Reduced Risk of Cancer – Results from the Netherlands Cohort Study published in 2018 found that eating peanuts daily was associated with a decreased risk of a hard-to-treat type of breast cancer in postmenopausal women . Another Netherlands Cohort Study published in 2018 found that men who consumed a teaspoon or more of peanut butter a day had a lower risk of pancreatic cancer . Reduced Risk of Heart Disease – A study published in the Current Atherosclerosis Reports in 2018 found those who consumed peanuts regularly had a reduced risk of dying from cardiovascular disease . A 2017 study that examined more than 200,000 participants showed that regular peanut consumption was associated with a 15% reduced risk of coronary heart disease . Reduced Risk of Diabetes – A 2016 study from Harvard University showed that substituting a serving of animal protein for a serving of plant protein like peanuts and peanut butter significantly reduced risk of type 2 diabetes . Another landmark study published in the Journal of the American Medical Association had previously shown that peanut butter consumption reduced type 2 diabetes risk by 21% in women . Reduced Risk of Alzheimer’s – Peanuts have high levels of niacin and are a good source of vitamin E, two nutrients that have long been known to protect against Alzheimer’s disease and age-related cognitive decline. One study showed that, in almost 4,000 people 65 years or older, niacin from food slowed the rate of cognitive decline . Another study highlighted that vitamin E intake could delay functional decline in patients with Alzheimer’s disease . Miracle Cure for Malnutrition There are more than 50 million children in the world who suffer from malnutrition. Peanuts have been helping to fight childhood malnutrition all across the world since 2005 in the form of ready-to-use therapeutic foods (RUTFs). The RUTF product is a peanut paste that also contains skimmed milk powder, vitamins and minerals. This combination is blended together in just the right proportions to help malnourished children recover in weeks. As malnutrition continues to affect millions of children, peanut-based RUTFs continue to be one of the most effective ways to treat it. New Research on Peanut Allergies Research indicates that the early introduction of peanuts in children can safely prevent peanut allergies later in life. The LEAP Study (Learning Early About Peanut Allergy) showed that children exposed to peanut foods between 4-11 months of age had an 86% percent reduced risk of a peanut allergy at the end of five years . “It was Hippocrates, the father of medicine, who famously said, ‘Let food be thy medicine and medicine thy food.’ I am excited that as a society we are in a place where we are realizing that eating a tasty snack like peanuts is not just a way to stop hunger pangs; this superfood can deliver powerful benefits to our bodies that help to maintain and restore health,” says Dr. Sterling. Based in Albany, Ga., The Peanut Institute is a non-profit organization supporting nutrition research and developing educational programs to encourage healthful lifestyles that include peanuts and peanut products.  The Peanut Institute pursues its mission through research programs, educational initiatives and the promotion of healthful lifestyles to consumers of all ages. As an independent forum, The Peanut Institute is uniquely positioned to work with all segments of the food industry, the research community, academia, consumer organizations and governmental institutions. Lee, J., et al., The relationship between nut intake and risk of colorectal cancer: a case control study. Nutr J, 2018. 17(1): p. 37. Nieuwenhuis, L. and P.A. van den Brandt, Total Nut, Tree Nut, Peanut, and Peanut Butter Consumption and the Risk of Pancreatic Cancer in the Netherlands Cohort Study. Cancer Epidemiol Biomarkers Prev, 2018. 27(3): p. 274-284.
van den Brandt, P.A. and L. Nieuwenhuis, Tree nut, peanut, and peanut butter intake and risk of postmenopausal breast cancer: The Netherlands Cohort Study. Cancer Causes & Control, 2018. 29(1): p. 63-75. Yanjie, Z., et al., Peanut consumption associated with a reduced risk of esophageal squamous cell carcinoma: A case–control study in a high-risk area in China. Thoracic Cancer, 2018. 9(1): p. 30-36. Coates, A.M., A.M. Hill, and S.Y. Tan, Nuts and Cardiovascular Disease Prevention. Curr Atheroscler Rep, 2018. 20(10): p. 48. Malik, V.S., et al., Dietary Protein Intake and Risk of Type 2 Diabetes in US Men and Women. Am J Epidemiol, 2016. 183(8): p. 715-28. Jiang, R., et al., Nut and peanut butter consumption and risk of type 2 diabetes in women. Jama, 2002. 288(20): p. 2554-60. Morris, M., et al., Dietary niacin and the risk of incident Alzheimer’s disease and of cognitive decline. Journal of Neurology, Neurosurgery, and Psychiatry, 2004. 75(8): p. 1093-1099. Shinohara, M. and M. Yamada, [Vitamin E and Alzheimer’s Disease]. Brain Nerve, 2015. 67(12): p. 1509-13. Toit, G.D., et al., Randomized Trial of Peanut Consumption in Infants at Risk for Peanut Allergy. The New England journal of medicine, 2015. 372(9): p. 803-813.